Calling the police on black people isn’t a Starbucks problem. It’s an America problem. 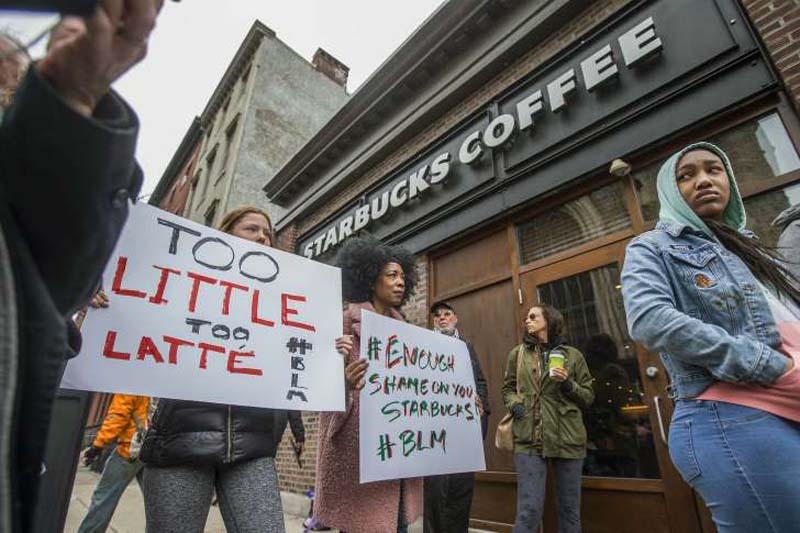 It’s good that Starbucks, with its announcement this week that it will close thousands of stores for a day of “racial bias training” in May, is taking steps in the right direction after a video of two black men getting arrested in one of its coffee shops went viral. But white America’s habit of needlessly calling the police on black people is not just a Starbucks culture problem. It’s an American culture problem. The tragic examples are all over the Internet. In McKinney, Tex., in 2015, after a neighbor called police about a pool party, a responding officer used brute force on 15-year-old Dajerria Becton, slamming the girl to the ground by her hair and jamming his knees into her back and neck. The video of the sobbing, 100-pound, swimsuit-clad girl went viral. The officer was fired. That same year, South Carolina officer Ben Fields was fired over a viral video of him flipping a black high school girl over her desk and dragging her across the classroom. Her offense? Refusing to put away her cellphone. And, of course, who can forget what happened in 2009 when a woman in Cambridge, Mass., called 911 to report a possible burglary in her neighborhood? The man she called the cops on was renowned black Harvard University professor Henry ­Louis Gates Jr. He was arrested and charged — for trying to get into his own house. The first U.S. memorial to the victims of lynchings is set to open next week in Montgomery, Ala. Black people in this country have long known that disturbing white Americans in white spaces can mean death. “In the early decades of the 20th century,” author Isabel Wilkerson noted in the New York Times, “a caste system ruled the South with such repression that every four days an African-American was lynched for some perceived breach or mundane accusation — having stolen 75 cents or made off with a mule.” Indeed, between 1877 and 1950, almost 4,000 black people died this way, mostly in Southern states. What the Starbucks incident has in common with the lynchings of the past — as well as the police brutality and mass incarceration of the present — is the basic fact that black people in America can be physically eliminated at any time, in any place, for little reason — whether that means being kicked out of stores, suspended from school, priced out of their neighborhoods, locked up in jail or put in the grave. Maybe something like this could help. It would certainly be better than having the second thoughts come after the fact, after it’s too late. In Sacramento in March, a white neighbor investigating the sound of breaking glass called the police to report a man in a hoodie on his street. Stephon Clark wound up dead, in his grandmother’s back yard, after police fired 20 rounds at him. He was unarmed. The neighbor has said he never wants to call 911 again. Starbucks will do what it needs to do to protect its brand. But what is America doing to protect its own citizens of color? Who will train Americans to stop calling the cops on their unarmed black neighbors? Who will train school officials not to use police force on black kids just for being kids? Who will train the ­convenience-store managers? The mom-and-pop restaurants? And how can we up the social and legal costs for people who make life-threatening decisions by calling the police on peaceful black people? In 2018, I don’t think America has an answer. Politics - U.S. Daily News: Calling the police on black people isn’t a Starbucks problem. It’s an America problem.